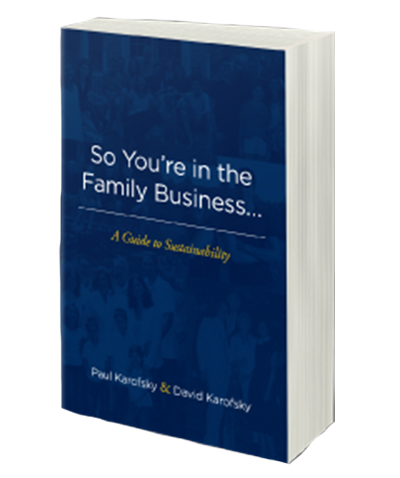 So You’re in the Family Business is a comprehensive manual on how to navigate the common problems that may arise within a family business. The Karofskys use real case studies to demonstrate effective and ineffective communication styles as they relate to family members in business together. The father-son team covers the subjects of intergenerational communication, decision-making, succession planning, and passing the baton onto the next generation. Paul and David have seen it all and been through most of these situations themselves in their family business. Let them guide you through the sometimes rough seas of running a family enterprise. Receive your COMPLIMENTARY chapter by signing up today!